About a year ago, in autumn 2016, I agreed to become the Editor of CapX. It was, and is, a fascinating job to try to make the case for free markets at a time when faith in them is at arguably its lowest ebb since the 1930s. As of October 2017, I have been asked to take on the job of running the Centre for Policy Studies, CapX's parent organisation. The CPS, for those who don't know their Westminster history, has an extraordinary heritage. It was founded by Sir Keith Joseph and Margaret Thatcher in 1974 with a brief to shatter the mould of British politics - which it promptly did, acting as the great intellectual engine room of the Thatcher revolution. Today, with so many people feeling that the economy is not delivering for them, the need for such fresh thinking is even greater. We need to find not just the language but also the policies to deliver prosperity and reinvigorate the economy - and cope with the transformative effect of all the phenomena I wrote about in The Great Acceleration. I promised in the hardback edition of ‘The Great Acceleration’ that there would be an online bibliography. It turned out - ever so ironically - that life got away from me. So to celebrate the publication of the paperback edition in the UK, here is a far from complete reading list for anyone who’s interested in the topics covered. All the titles on here are recommended - I read dozens more that didn’t make the cut - but the titles with notes underneath in italics are those that I found particularly useful or interesting. The father of the “life is getting faster” genre, to which I and others owe a tremendous debt. Written before the internet really got its hooks into us but still relevant and fascinating. I disagree with many of Carl’s conclusions and recommendations, but his is an excellent analysis. An excellent book, translated from the German, about the pace of daily life. Why do people in some cultures move faster than others? The definitive guide. As a novel, it’s far too didactic. As social commentary, it’s right on the money. If everything you know about Mark Zuckerberg comes from The Social Network, this is the history for you. Fascinating history of the telegraph, drawing out the parallels with today. Really excellent primer to our new algorithmic world. The best history yet of Jeff Bezos and Amazon. I used the material about dating, but there’s plenty more fascinating stuff in this book. John Brockman (Ed) - Is The Internet Changing The Way You Think? Powerful counter to the idea that you always need to put yourself forward to get ahead. First and best of the ‘technology is frying our minds’ genre. Really good study of how habit rules our lives, and how we can adapt. Another really good study of how we can keep our heads in a fast-paced age. If you still think humans are rational creatures, this is the book for you. Partnoy is normally a business writer, but this on the power of patience was fascinating. A great science writer explains why we’re all just animals underneath. The antidote to Carr - why technology isn’t destroying our minds. New York Times columnist uses the latest research to explain modern life. It’s fair to say he’s against it. Excellent guide to what computers are doing to our social lives. If you read one book on this list, make it Schulte’s masterful examination of how we’re all stressed as hell. Her dislike of capital letters is weird, but the research on how young people actually use the web is fascinating. The case for human-robot relationships. An overwhelmingly convincing demolition of the long tail. The first of these is the best possible antidote to the idea that we’re all dumbing down. Why modern music sounds like it does, from one of the New Yorker’s best writers. Fascinating exploration of the dark underbelly of the net. Blasts you with detail but there's so much to get to grips with here. David Cameron’s ideas man provides a stark verdict on modern government. Jaron Lanier - Who Owns the Future? How change is sweeping the world, and how governments are struggling to cope. Morozov is one of our most caustic critics of digital utopianism - his debut is particularly recommended. Two of Google’s biggest beasts on how the world is changing. How the economy is shifting from share-the-wealth to winner-takes-all. That rarest of things - a political memoir which is also relentlessly readable. Noted author provides a very readable primer to the financial crisis. The story of high-frequency trading, told with novelistic verve. The rise and fall of RBS, in jaw-dropping detail. The inside story of the financial crisis. A must-read for anyone interested in business, finance or how the hell we got here. The case against modern farming. The case for modern farming, sort of. The modern food ecosystem, examined in forensic detail. How the world’s resources are increasingly devoted to feeding its cities. How mankind is reshaping the planet. Fascinating study of the ageing population and its implications. Commuting is dull. This book about it is fantastic. How mankind is reshaping the planet, again. Humanity is now an urban species. Here’s what that means. Must-read study of modern China from the long-serving New Yorker correspondent. Why AI could kill us all, the thoughtful version. I liked it so much I pretty much stole the whole thing. Thomas Friedman is the dean of the New York Times comment pages and multi-million-selling author of The World is Flat - and his new book, Thank You For Being Late, takes as its topic the way in which the world is getting faster. I've known about Friedman's interest in this topic since roughly the point I was finishing up the first draft of The Great Acceleration (though I always expected him to call it The World is Fast). But it's still strange to have someone else's work overlap with your own - to see what ideas you have in common and where you diverge. I've reviewed the Friedman book for the Times Literary Supplement this week - if you've read both, I'd be fascinated to know what you think. 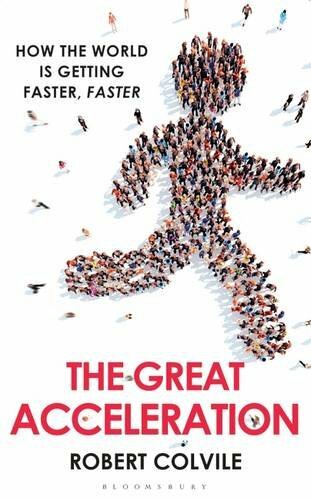 And just a reminder to anyone still deciding on their Christmas shopping - The Great Acceleration makes a wonderful present for anyone interested in how the world is changing (especially if they're too busy to shop for themselves). Buy it here.